– The elegant white and clear look spruces up your kitchen. 6 SAME SIZE STORAGE CONTAINERS: This Kitchen Organization Set Includes 6 Medium Air-Tight Containers That Are All the Same Size. Each One Has A 1-Liter Capacity (0.9QT/ 4.2 Cups/ 0.26 Gallons), Measures 5.2″ X 3.8″ X 6.25″, Great for Storing Everything from Flour, Crackers, Snacks, Pasta, Coffee, Rice, Sugar, To Smaller Servings of Cereal. NO PLASTIC TASTE: No Dealing with Tainted Flavors. 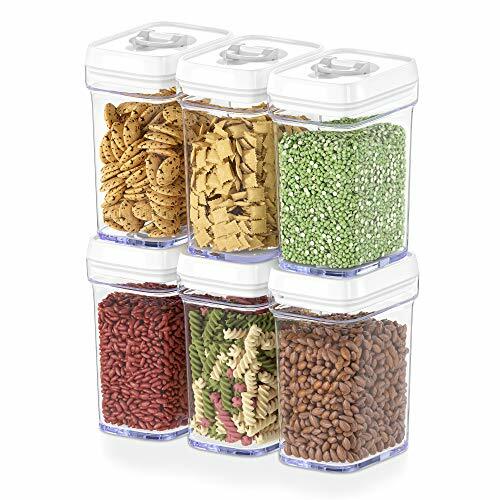 Our Dried Food Storage Six Piece Set Is Made Using Thick and Durable Plastic That Never Alters Taste, is 100% BPA-Free, And Treats You to Hassle-Free Maintenance. Clean-Up Is A Breeze. Just Remove the Silicone Gasket on The Lids, Wash with Soap and Water, Replace the Gasket, And You’re Good to Go.